BERKELEY – The University of California, Berkeley, is partnering with Intel Corp. and Microsoft Corp. to accelerate developments in parallel computing and advance the powerful benefits of multi-core processing to mainstream consumer and business computers. Microsoft and Intel announced today (Tuesday, March 18) the creation of two Universal Parallel Computing Research Centers (UPCRC), the first at UC Berkeley and another at the University of Illinois at Urbana-Champaign. The two centers comprise what is considered the nation’s first joint industry and university research alliance of this magnitude that is focused on mainstream parallel computing. The funding for UC Berkeley’s UPCRC, which Patterson directs, forms the foundation for the campus’s Parallel Computing Laboratory, or Par Lab, a multidisciplinary research project exploring the future of parallel processing. Patterson’s leadership in the computing field was recognized today by the Association for Computing Machinery, which honored him with its 2007 Distinguished Service Award. Over the next five years, Intel and Microsoft expect to invest a combined $20 million in the two university centers, with each center receiving half. Researchers at the UC Berkeley center have also applied for a UC Discovery Grant, a matching grant mechanism that uses state and university funding to leverage industry investments in UC research. Research from this effort is expected to lead to powerful new mainstream applications, such as a cell phone that allows a user to recognize the face of an approaching acquaintance and, more importantly, to whisper that person’s name into the user’s ear. Another application may be speech recognition software that can act as a court reporter by providing an accurate, written record of what was said by numerous people in a court or conference room. A diverse group of UC Berkeley researchers has been discussing the challenges of parallel computing for years. In February 2005, it began meeting weekly to discuss this parallel revolution from many angles. Those meetings led to a widely read white paper outlining the coming challenges of parallelism, in addition to the creation of the Parallel Computing Laboratory. Additional background about the discussions at UC Berkeley on the landscape of parallel computing research is available online. In addition to Patterson, the center includes seven other UC Berkeley faculty members from the Department of Electrical Engineering and Computer Sciences. Serving as principal investigators are Krste Asanovic, Ras Bodik, James Demmel, John Kubiatowicz, Kurt Keutzer, Koushik Sen and Katherine Yelick. Patterson, Demmel and Yelick also have joint appointments at the Lawrence Berkeley National Laboratory. The Par Lab not only brings together researchers focused on software and hardware, but also experts in disciplines ranging from music to medical technology to help push state-of-the-art computing applications in a wide range of fields. The concept of parallel computing, in which a task is divided up into smaller bits to be completed simultaneously to achieve greater speed and performance, has been around for more than 40 years, but it has been the domain of highly specialized programmers and scientists. New “duo-core” and “quad-core” products that squeeze multiple processors onto a single, integrated circuit have successfully met the increased demand for performance in desktop and mobile computers, but researchers and industry experts are looking to a day when a computer chip will hold hundreds of processors. The challenge ahead for the technology industry lies in bringing to mainstream developers and, ultimately, consumers, the benefits of multi-core processing based on tens or even hundreds of cores. A joint Intel-Microsoft technical evaluation committee selected UC Berkeley’s Department of Electrical Engineering and Computer Sciences from among 25 of the country’s leading computer science departments to host one of the two UPCRC sites. Research funds for the new center will be used to advance parallel programming applications, architecture and operating systems software. The center at UC Berkeley will host, in addition to the director and seven principal investigators, six members of the UC Berkeley faculty and 50 doctoral students and postdoctoral researchers. Software developed by the center will be provided to the technology community for additional development. 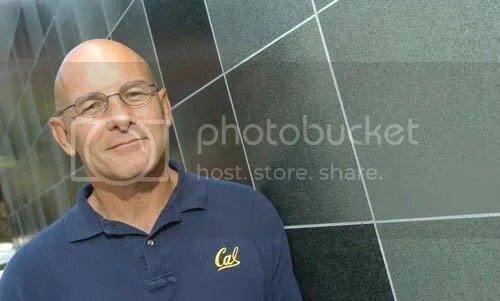 BERKELEY – A human hormone known to stimulate the growth of cells throughout the body has a new role – helping to set up the proper nerve connections in the odor center of the brain, according to University of California, Berkeley, scientists. The hormone, insulin-like growth factor (IGF), is well-known to biomedical researchers and has been tested as a therapy for diabetes and some growth disorders. Until now, decades of research have turned up only one solid role for IGF, however, and that is to makes cells grow and multiply. Neuroscientist John Ngai, Coates Family Professor of Neuroscience and director of the Functional Genomics Laboratory at UC Berkeley, and his colleagues have now found that IGF plays a critical role in setting up the connections between chemical detectors in the nose and the brain’s olfactory centers. These centers, the olfactory bulbs, are a pair of raisin-sized structures in the front part of the brain that analyze signals from the many odor receptors in the nose. IGF joins a small number of identified molecules known to direct the growth of nerve cells in the brain during its development, making it “another tool in the brain’s tool kit for how you wire up the brain,” Ngai said. Aside from what this reveals about how the brain wires itself as it grows, these molecules could become important therapeutically once doctors begin implanting new cells, perhaps stem cells, into the brain to cure neurodegenerative diseases, Ngai said. Ngai and colleagues at UC Berkeley, the Shanghai Institutes of Biological Sciences in China and Columbia University Medical Center reported their findings in the March 27 issue of the journal Neuron. The molecules netrin, ephrin, semaphorin, slit and now IGF are called axon guidance molecules because as nerves stretch their tentacle-like axons out into the brain to connect with other neurons, these molecules act as signposts to steer the axons to the correct brain cells. As the brain grows during early development to some 3 billion nerve cells, each nerve cell makes, on average, 10,000 connections with other nerve cells, so “guidance cues” are critical. So far, these axon guidance cues include chemoattractants that make axons grow toward them, and chemorepellants, which make them turn away. As shown by Ngai’s colleagues in China, IGF is an attractant; the growth cones of axons turn toward higher concentrations of the hormone. Compared to the visual system, the brain’s odor system is still poorly understood, but it appears to have its own uniquely ordered connections, Ngai said. The nose contains some 5 million nerve cells, each of which carries only one kind of odor receptor out of about 1,000 different odor receptors, each tuned to detect different chemicals or odorants. Nose nerve cells that detect the same odorant send their axons to the same region of the olfactory bulb, and it appears that neurons that detect similar chemicals, such as different alcohols, send their axons to nearby areas of the bulb. Scientists previously had discovered that each of our two olfactory bulbs is divided down the middle between two mirror-image representations of the nasal odor receptors. Ngai and his colleagues found that IGF is responsible for setting up these mirror images within the bulb. Axons from the nose appear to express receptors for IGF on their growth cones, which allow the growth cones to essentially sniff out the IGF in the olfactory bulb and follow the trail to the proper target cells. Without the IGF produced in the olfactory bulb, the growing axons do not make the turn-off to the outer half of each bulb, but instead go only to the inner side nearest the midline of the brain. 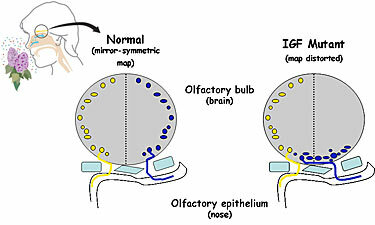 Both of the IGF protein’s forms, dubbed IGF-1 and IGF-2, are expressed by cells in the olfactory bulb, as determined by DNA microarray screens and other techniques. While IGF appears critical in the early stages of olfactory development, when the basic architecture of the olfactory bulb is being set up in the fetus and perhaps also after birth, other axon guidance cues are no doubt needed to more finely direct the growth of axons, Ngai said. He is continuing to investigate these other cues, and also to map the nose’s chemical receptors to specific areas of the bulb. Ngai and his colleagues also are following up on some early leads indicating that IGF may serve as a chemoattractant in other parts of the developing brain. Ngai’s coauthors are former UC Berkeley graduate students Jonathan A. Scolnick and Cynthia D. Duggan, Kai Cui and Xiao-bing Yuan of the Institute of Neuroscience at the Chinese Academy of Sciences, and Shouhong Xuan and Argiris Efstratiadis of the Department of Genetics and Development at Columbia University Medical Center. The research is supported by grants from the National Institute on Deafness and Other Communication Disorders and the National Cancer Institute of the National Institutes of Heath, the Natural Science Foundation of China, and a gift from the Berrie Foundation. BERKELEY – Managing a socially responsible investment fund is one of the new learning experiences the University of California, Berkeley’s Haas School of Business is offering its graduate students for the first time this fall. The new Haas Socially Responsible Investment (HSRI) Fund came about thanks to a $250,000 gift from Haas School alumnus Charlie Michaels and his wife, Doris. Charlie Michaels earned his undergraduate business degree at the Haas School in 1978 and now serves as the president of Sierra Global Management, an investment management firm in New York City. The fund will be managed by UC Berkeley MBA and Master’s in Financial Engineering (MFE) students with the advice of an investment advisory committee and a Haas School faculty advisory committee. Its investment philosophy will be to achieve a balance between financial and social or environmental performance. Students will start investing when the fund reaches $500,000, a goal that Haas’s Kellie McElhaney expects to reach within a few months. The center’s ultimate goal is to raise the fund to $1 million. The idea for the HSRI Fund was developed by McElhaney and Charlie and Doris Michaels at the Social Performance Metrics Conference, an event on metrics for corporate social responsibility that was held at Haas School in April 2005 with the participation of the London School of Business and Boston University. “We are tremendously grateful to Charlie and Doris for giving our school this opportunity to do something innovative that adds to our students’ experience with investing for both social and financial value,” said Haas School Dean Tom Campbell. To gain some theoretical footing in this kind of investing, students managing the fund will be required to enroll in a new elective on socially responsible investing techniques, being offered by the Haas School for the first time this fall. The HSRI Fund exposes UC Berkeley MBA and MFE students with a keen interest in corporate social responsibility or finance to the investing world’s complexities, challenges, and rewards – both financial and social. A group of students will be chosen by a special committee to make investment decisions for the HSRI Fund’s portfolio, taking on fund manager and portfolio analyst roles. The students will determine detailed socially responsible investment criteria, with a focus on companies using sustainability principles as a core part of their business strategies, practices and investments. The Center for Responsible Business will send out an annual call for applications for the HSRI positions to all UC Berkeley MBA and MFE students. The number of students who participate is expected to increase from five to 10 as the fund grows. In addition to the learning opportunities this fund provides, the center expects that the investment data to be gathered by the fund will help advance the methodology and the understanding of how well socially responsible investment funds can perform. In fact, the consequences of pressing that button transcended mere threats: Beyond a fatwa on the cartoonists themselves, firings and even jailings of editors who chose to reprint their work, and the forced resignation of government ministers in Italy and Sweden, more than 100 people worldwide were killed in riots triggered by what some Islamic leaders called an outrage against their religion. Even in the United States, home of the First Amendment, most major news outlets declined to run the cartoons, either on ethical grounds or for fear of contributing to further violence. Returning to campus last week as this year’s Una’s Lecturer, former Boalt Hall professor Robert Post, now David Boies Professor of Law at Yale University, said that while the decision to publish the cartoons was “in part a provocative act,” the cartoons themselves are “rather far, legally, from hate speech,” and thus deserving of protection under the laws of a democracy — including those in Europe, where the legal questions proved less cut-and-dried than they were here. As Post recounted, the genesis of the controversy was a complaint from the author of a biography of Muhammad, who said he was unable to find anyone willing to illustrate his book. That led the arts editor of the Danish paper to issue invitations to the Danish Cartoon Society to submit their visions of the man considered to be Islam’s founder. In the paper on which he based his lecture, Post himself deemed the cartoons “certainly a good deal less vicious and racist than the anti-Semitic cartoons that routinely appear in the Arab press.” During his presentation he offered selections from a contest held in Iran in the wake of the controversy to lampoon the Nazi Holocaust. Iran’s response, he said, was intended to show the hypocrisy of those who defended the publication of anti-Muslim images. But while it’s true that a few European countries — notably France and Germany — outlaw “Holocaust denial,” most have no such prohibition. “The charge wouldn’t stick in Denmark” or in most other Western nations, he said. 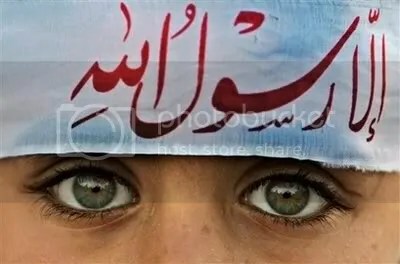 A number of images demonstrated the propensity of non-Muslim publications to caricature iconic figures of other religious traditions, including Judaism and Christianity. “This theme that the secular West has a right to criticize religion — all religions, equally — becomes a major theme in the controversy,” he explained. In the United States — where the First Amendment allows most speech to be regulated only on the basis of a showing that it would cause imminent harm — there is “no issue whatever that these cartoons would be protected speech,” Post said. In Europe, by contrast, “there doesn’t have to be a clear and present danger” to warrant censorship by the state. What he called “the legitimating function of speech” arises from Americans’ ability to identify with the government based on the premise that “the government is responding to public opinion, and we’re all free to try to influence public opinion.” While this isn’t by itself enough to ensure that we are “self-governing,” he added, it is a necessary precondition for self-governance. But even when speech is “likely to cause discrimination” against members of a particular religion, drawing the line between protection and suppression is “a difficult and complex issue,” Post said, adding that “the most obvious way” to decide the question is to rely on the distinction between hate speech and ordinary expression. The cartoons published by Jyllands-Posten — and available for viewing, along with other images and background information, at www.zombietime.com/mohammed_image_archive/jyllands-posten_cartoons — are “plainly about public issues,” Post concluded, and thus constitute fair criticism, no matter how offensive some people may find them. America Bashing – What’s the Big Deal Anyway? What’s so bad about America bashing besides the fact that it’s unpatriotic* and possibly seditious? Christopher Caldwell, a senior editor at The Weekly Standard and frequent contributor to the Financial Times (FT) makes a few suggestions [about the nature of identity and citizenship] in his article critiquing a new British report on the same, which provides a rather accomodating segue to answering that question. In Uneasy birth of a ‘creedal’ nation, Caldwell critiques Lord Goldsmith, the former attorney-general, in his new report, “Citizenship: Our Common Bond” to suggest that a revival of the Treason Act of 1351 is not necessarily as backward-looking as it may seem, and by extension, loyalty to one’s home country can be seen as a rather indispensible concept. Today in the multicultural state of Britain, as in the US and France, among other republics, states Caldwell regarding Goldsmith’s report, national identities are built on creeds – i.e., a set of philosophical beliefs – rather than arising out of traditional ethnic or historical similitudes. Caldwell says that this notion is radically egalitarian in assuring that natives are treated no differently than foreigners. A pledge of loyalty can be seen as a token of submission; in society, we must be accountable to one another or else we will reap chaos and trouble. If we do not have common origins, people can claim cultural autonomy and separate standards, which bedevil any attempt at imposing a rule of law. Lawlessness always brings tyranny and thus, we must secure liberty by either or a combination of the two following means: 1. Common ethnicity/history and 2. Common values. The pledge of allegiance, as in the US, or establishing treason acts (as in Britain) is a compromise rather than putting out all foreigners who don’t look or act like us (such as in Russia, among other countries as of late). Lib Dems, Socialists and what have you should take heed that when their platform trades on the notion of ‘fairness’ and ‘equity’, an arrogant disafiliation with [patriotism] or nationalism is a repudiation of those very ideals; that the rejection of these norms is an unsustainable path, hence, a watermark of their own decline. Enter the golden straightjacket. *patriot. A term used during the American Revolution to discriminate rebels from loyalists [to the British Crown]. This word has subsequently come to connote all things American.